Think of the typical toppings on your baked potato — butter, sour cream, maybe cheese and bacon bits. If you substitute a sweet potato, you might not need any of that. Baked sweet potatoes are so full of flavor, they require very little embellishment. This can save you loads of calories. As a bonus, sweet potatoes are packed with potassium, beta carotene, vitamin C, and fiber. This approach to weight loss is one of the most simple ones I have seen in a long time, so if you love beans, then this diet may be for you. It’s actually quite easy, all you need to do is replace sugars and starches with beans, and you’ll see the immediate effect of consuming slow burning carbs. However beans are not just for weight loss, they are super nutritious, and are great to include in your everyday meals, so here is how to get you started with beans. The health benefits of carrot include reduced cholesterol, prevention from heart attacks, warding off certain cancers and many others. Most of the benefits of carrot can be attributed to its beta carotene and fiber content. This root, which has a scientific name of Daucus Carota, is a good source of antioxidant agents as well. Carrots are rich in vitamin A, Vitamin C, Vitamin K, and potassium. Prevent heart diseases: In a study meant to reveal therapeutic value of carrots researchers at the Wolfson Gastrointestinal Laboratory in Edinburgh, Scotland revealed that cholesterol level reduces by 11 percent if seven ounces of raw carrots a day is taken for thee weeks. High cholesterol is a major factor for heart disease. Since regular consumption of carrots reduces cholesterol level it is good to prevent heart related problems. A group of Swedish scientists discovered that root vegetables can reduce the chances of having a heart attack. A study conducted at the Mario Negri Institute of Pharmacological Research in Italy found that those who ate more carrots had one third the risk of heart attack as compared with those who ate fewer carrots. Prevent cancer: Beta-carotene consumption has been linked to reduced risk of several cancers, notably lung cancer. British researchers discovered that increasing beta-carotene consumption from 1.7 to 2.7 milligrams a day reduced lung cancer risk more than 40 percent. The average carrot contains about three milligrams of Beta-carotene. In a study, researchers found that eating fiber rich carrots reduce the risk of colon cancer by as much as 24 percent. Another study shows that women who ate raw carrots were five to eight times less likely to develop breast cancer than women who did not eat carrots. Macular degeneration: This is a common eye disease of elderly. It impairs the macula. Researches found that people who ate the most Beta-carotene had a forty percent lower risk of macular degeneration compared with those who consumed the least. Improves eyesight: Deficiency of vitamin A can cause some difficulty seeing in dim light. Since carrot is rich in vitamin A it is good for improving eyesight. Stroke: A carrot a day reduces stroke risk by 68 percent. 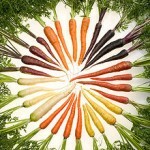 Many studies have strengthened the “carrot effect” on brain. Studies conducted on stroke patients revealed that those with highest levels of Beta carotene have the best survival rate. Diabetes: Carrot is good for blood sugar regulation because of the presence of carotenoids in carrot. Carotenoids inversely affect insulin resistance and thus lower blood sugar. 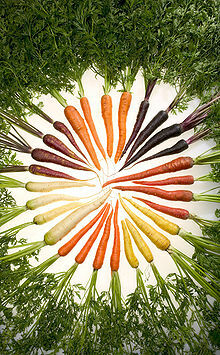 Carrots have antiseptic qualities and therefore, can be used as laxative, vermicide and as remedy for liver conditions. Carrot oil is good for dry skin. It makes the skin softer, smoother and firmer. Carrot juice improves stomach and gastrointestinal health. Thus, carrots, as raw fruits juice or in cooked form, are good for your health. foods that won’t sabotage your budget or your blood sugar. and cheese omelet, or hard-boiled on their own or made into egg salad. protein, and lots of fiber. Add beans to salads, soups, tacos, dips or chili. a quick and healthy tuna salad. can throw a sweet potato in the microwave and have a great side dish in a flash. should be a part of your weekly grocery list. They can complete a meal in just a few minutes. or grill your veggies (see recipe at the end for Grilled Tomatoes). Legumes (like Pinto Beans), have a high carb count but a much lower “net carb” or “digestible carb” content. They contain several vitamins and minerals. They are a good source of dietary fiber, which has a number of health benefits. For example, fiber helps protect against digestive disorders and disease. According to at least one clinical diet study, an eating-plan rich in beans can help patients with either type 2 or type 1 diabetes to reduce their daily insulin intake. Healthy low carb diets typically recommend beans in later phases of the diet plan. For more details about carbs in legumes, peas and beans, see below. Due to their high soluble fiber content (inc. gums, beta glucans, pectin), legumes are digested very slowly, are thus low on the glycemic index, and help maintain stable blood glucose levels and healthier glucose metabolism. Eating more beans helps to reduce the effect of high glycemic index foods by lowering the glycemic value of meals.